WINTER IN INDIANOLA - LUXURIOUS QUARTERS! I guess we have reached the comfortable quarters at last, which Gen. Washburne promised us at the close of a ten days march when we were at Carrollton. Been more than ten days coming through though, don't you think so? There are four companies in this house - A,B,D, and E. We have a nice story and half house, nicely painted - has belonged to the upper crust. There are ten rooms large and small in the house - seven down and three upstairs. Nineteen of us have one room about 16 feet square and 10 high. One corner is occupied by six men in three bunks one above the other - another has two bunks for six men - a third is occupied by five men in two bunks while Mr. Fenner and your soldier boy have the other corner all to themselves. We have our bunk put up between two windows to the lightest and I think the best corner of the room. We put up our own bunks. Now I have told you all about our house and room but had almost forgotten to tell you where we are and how we got here. But as I have commenced at the wrong end I will keep it up and tell you that we are in Indianola - or as it is sometimes called here Powder-horn. It was quite a stirring place before the war -- had about 2,500 inhabitants although it is now pretty deserted. A little fellow I was talking to this morning says the men have all gone into the army..
(I can scarcely write there is so much confusion in the room, some are singing, some playing cards, some tearing things up generally making all the noise they can conveniently, while two are reading and three of us trying to write -- no wonder I get everything in wrong end foremost.). Now for a brief review of the past three days. Tuesday every thing was going on as usual till about three o'clock when heavy cannonading was heard in this direction and in half an hour after the long roll beat in camp. I tell you now there was a rush about that time and in a very few minutes every body was out ready for a move. Fortunately the order was countermanded and we were ordered to be ready to move the next morning at seven o'clock. We were ready yesterday morning at the appointed time - had every thing on the boat but did not get off until about noon. Came up in the afternoon and were in our house and hard at work putting up our beds before dark. It is about twenty miles to Decrow's Point by water -- not so far by land. The regiment would stay in the private houses, after working hard to fix them up, for only two days before being ordered to move to a new campground just outside of town and back to their tents. 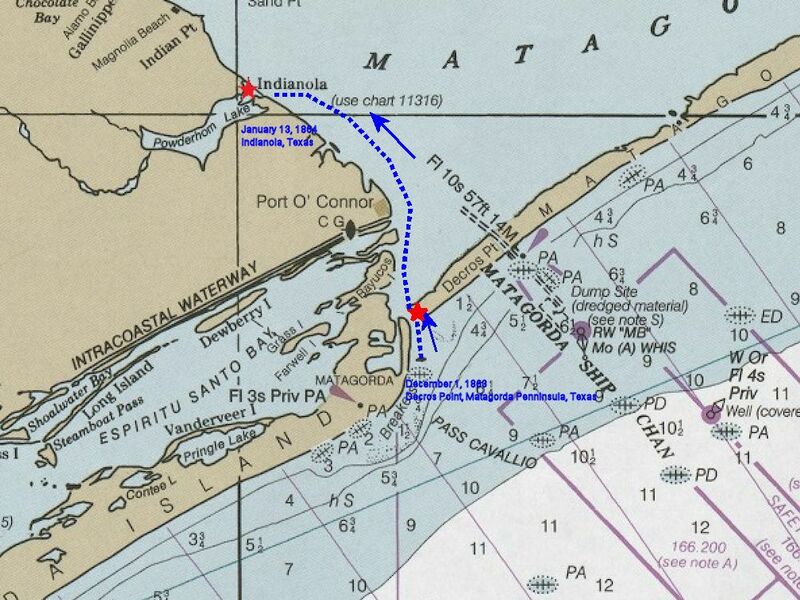 Detailed 1984 nautical map showing the approximate route of the 16th Ohio's from Decros Point, Matagorda Peninsula, Texas, across Matagorda Bay to the town of Indianola, Texas, on January 13, 1864, and where the regiment would spend several weeks. 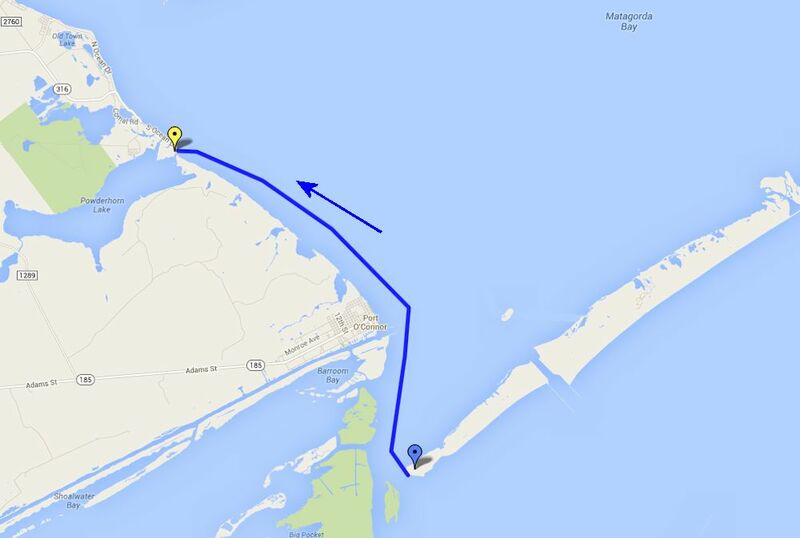 Modern day map showing the approximate route of the 16th Ohio's from Decros Point, Matagorda Peninsula, Texas, across Matagorda Bay to the town of Indianola, Texas, on January 13, 1864, and where the regiment would spend several weeks. Blue pin - Decros Point, Matagorda Peninsula, Texas - where the 16th Ohio Volunteer Infantry landed on December 1, 1863 and would spend many weeks during the winter of 1863 and 1864. Yellow pin - Indianola, Texas - where the 16th Ohio Volunteer Infantry landed on January 13, 1864, and would spend several weeks during the winter of 1864.